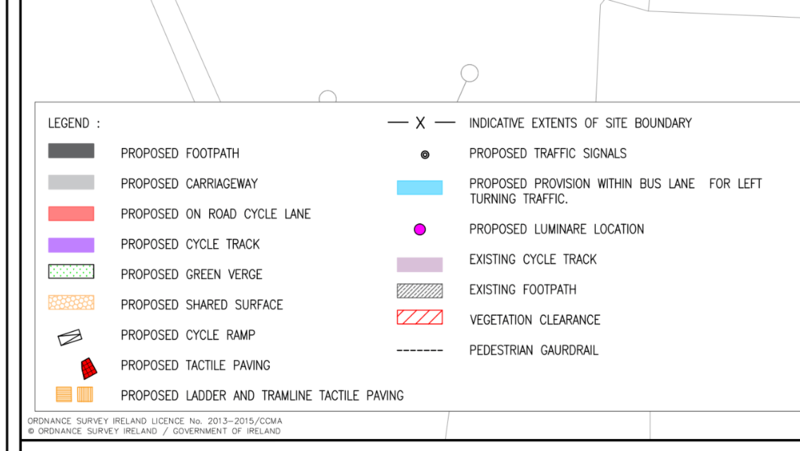 — New junction unfriendly to cycling and walking is part of access for Cherrywood. 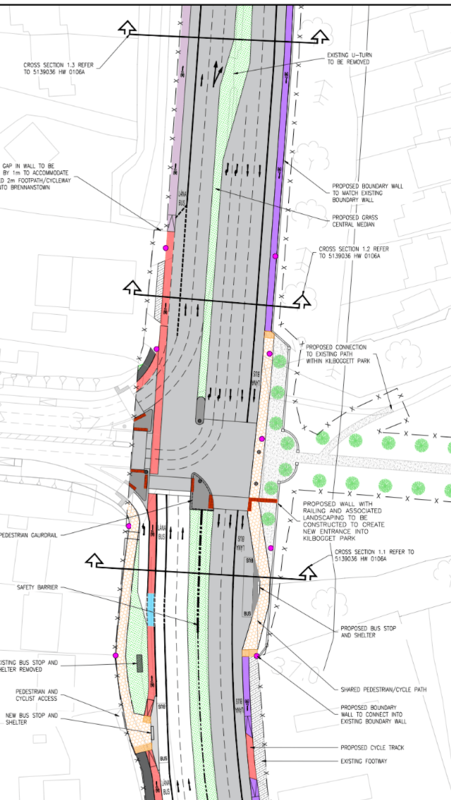 Dún Laoghaire-Rathdown County Council is planning a new sub-standard junction on the N11 with shared surfaces around bus stops and cycle lanes exposed to left hand slip turns. People walking and cycling who are exiting the new link road and traveling south at the new T-junction will have four staggered pedestrian crossings to cross — or people cycling can risk crossing three traffic lanes a short distance before the junction and then cross the 8-lane wide section of the N11. Commuters and others who currently cycle northbound on a cycle path will now be put across a shared area at a bus stop before quickly ending up on a unprotected cycle lane and exposed to traffic turning into a left hand slip turn. The unprotected cycle lane will continue for some distance north of the junction before reverting to a cycle path. 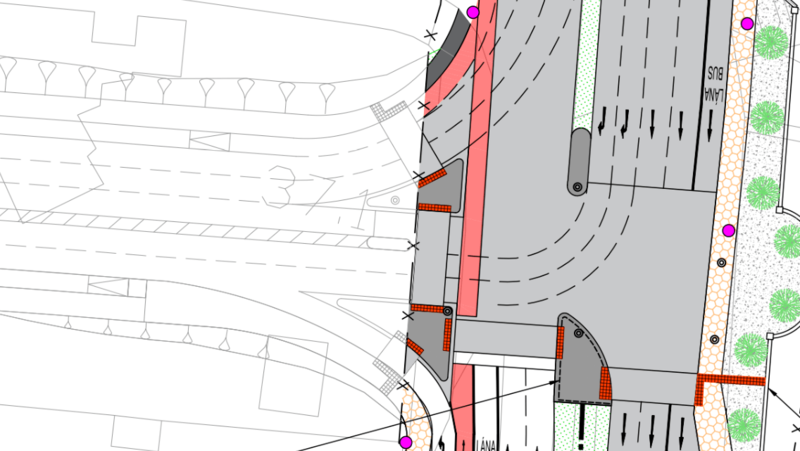 People cycling and walking from north (the city direction) into Cherrywood will have to cross two shared staggered crossings with shared footpath space around the crossings and at bus stops at the junction. A report and drawings on the planned project can be found at dlrcoco.citizenspace.com. The council said that submissions or observations with respect to the works, can be made on the same page via an online submission form. 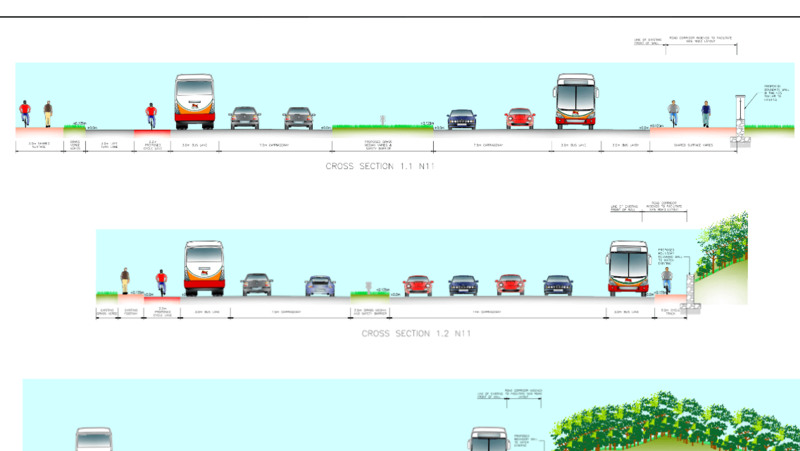 Could they not remove the central median and give more road with to a protected cycle lane? Surely this road could move just as smoothly at lower speeds and tighter lanes? Why have a full dual-carriageway in an urban setting anyway? Reduce speed, reduce pollution, keep the flow moving, and offer safe and free-flowing transit and active transport in the same space. Or are road engineers still road engineers and not allowed to think of other idea’s other than a lick of paint?